I went along to the Grown Ups Premiere in New York City in the hope I got a long interview with Adam Sandler. Well I got an interview with him but it was very brief. Also chatted with David Spade and comedy legend Chris Rock. Suprisingly Salma Hayek stopped for a chat. The red carpet was just after Australia got knocked out of the World Cup on goal difference and Mexico made it to the next stage to meet Argentina. As my World Cup tour of New York City continues I went out to investigate where all the Brazilian fans are hanging out. The pub is called Miss Favellas and I immediately loved it. I felt like i was in a rum shack in the Caribbean and then you look out the window and all you can see is the Williamsburg Bridge. 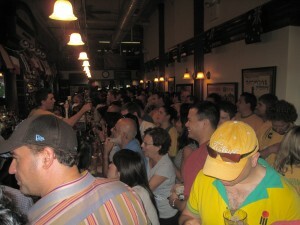 The place got very full and it was tough to get a drink when the match started. However, Miss Favellas had a great vibe and if Brazil go on a run through the World Cup this place would be a cracker to have some solid sessions in. Check out my video as I hope to see a load of Brazilian women there doing the samba…. Address: Wythe Ave + South 5th Street, Brooklyn….a bit of a walk from Bedford subway. Waking up today was a heck of a lot different than waking up yesterday. As an Aussie sports supporter you are engrained with eternal optimism. After our drubbing by the Germans yesterday a mate of mine, Bazza from Geelong, texted me on how the Socceroos are going to make it to the next stage of the World Cup. His text read, the Socceroos have to A: play better B: get the ball in the net C: stop the other team getting the ball in the net. He’s a sharp guy my mate Bazza. Although we weren’t meant to win yesterday against the Germans it wasn’t going to stop us from having hope and of course drinking a load of beers. The day before the Americans scored a goal against the English when they weren’t meant to. The phrase “scored a goal” is a little dubious. They may as well handed the ball to the English goalkeeper and asked him to walk it over the line. Sunday morning, before the big match, I stayed at home attempting to be a good husband and father. My son and I watched football all morning. I turned the volume of the TV up in the hope the controversial vuvuzela’s would somehow put the kid to sleep. That didn’t work, just made him more hyperactive. While looking after the kid I was trying to gauge if the Mrs actually knew I was heading to the pub for a massive soccer match between my homeland and the Krauts. I knew then that I was in a bit of strife of getting out of the house early. I attempted to clean around the house for half an hour. This didn’t soften the wrath as I walked out at 12.30pm. I knew I was in some sort of doghouse. 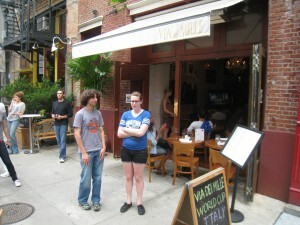 It was a quick walk to the The Australian Bar on 38th st btwn 5th and 6th ave owned by Matty Astil. It was packed and rocking by the time I got here. Full of green and gold it was like being back home in Australia and a serious Sunday session was beginning. Matty, the owner, by game time wasn’t letting people in, with a line forming outside. The place was rocking and jampacked. The crowd sang the Aussie national anthem with gusto and cheered the match as it kicked off. By the time the German’s slotted the 3rd goal people were crying in their beers. After the game finished, although a bit disgruntled with getting well and truly flogged, the party kicked on. The Mrs came and picked me up, helping me stumbled home. Woke up this morning to watch the Danes V Dutchies and the Mrs was alright with me. Wipe the slate clean and start again fresh the next day. The spirit of the World Cup. Now the Socceroos have to do that. And maybe take my mate Bazza’s advice; play better, ball in net, other team no ball in net. NOTE: Let me know where you are watching your games around the world. 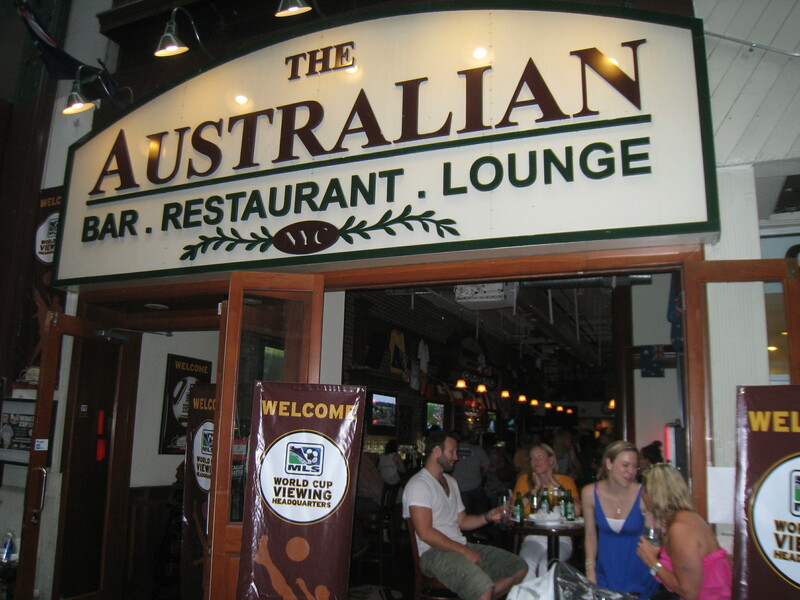 Send me a couple of pics the pub your watching the World Cup in. It was damn hard last night to find a Mexican joint to show the opening match of the World Cup – Mexico v Sth Africa; the goal was to find a Mexican restaurant full of Mexicans. 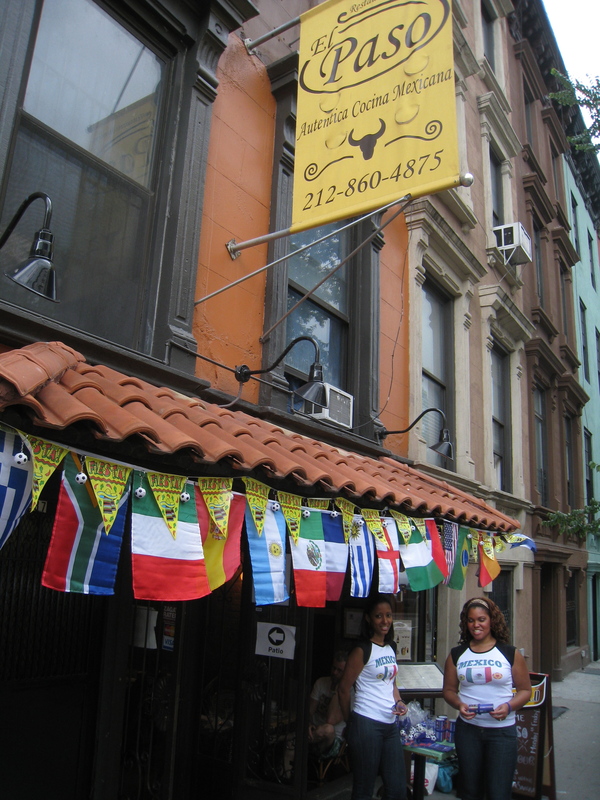 I rang the El Coyote restaurant in Queens which said they were going to open late in the day to show the French v Uruguay game. Not much Mexican patriotism from a Mexican restaurant. I got caught in a rain shower on the streets of New York last night with a Nicaraguan and he told me to get myself to East Harlem and around 116th st to watch the match. I made my way to East Harlem and found a Mexican restaurant called the El Paso. It was empty but they had some waitresses walking around in Mexican jersey’s and some Mexico T-Shirts. I later found out the girls in the T-Shirts were from the Dominican Republic but had been to Cancun once and claimed that made them Mexican. If that was the case I was more Mexican than them as I had been there three times. The El Paso restaurant had about ten people on their patio out back to watch the games. They had all the flags of the World Cup teams on the wall which looked quite pretty until I realized they didn’t have an Australian flag. Somehow they had managed to purchase a New Zealand flag. Where the hell did they find that? Out on the patio they had their HD TV going but somehow Telemundo doesn’t come in too well on the old HD so it was a bit fuzzy but bearable. There was only one Mexican watching the game with us. He managed to seduce the waitress into letting us all drink beer at Half time. The Mondelo’s started coming out. A delicious beer that I proceeded to smash for the second half which was tense as Mexico had played good but Sth Africa was on top with an exciting goal. All us non-Mexican’s on the bandwagon were depressed when the Sth Africans scored. Mexico finally managed to score but a somber atmosphere after the match. A good start to the World Cup and a venue that will deliver as the event rolls on. More Mexicans next time and at least some old guy wearing sombrero would be nice. Will be back there for the next game! El Paso on 116th st btwn 2nd and 3rd Ave.
My excitement of watching the match alone…..WATCH…. 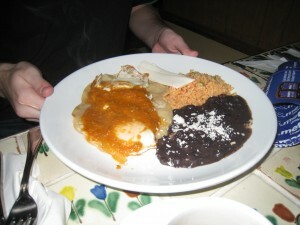 I love my Mexican beans……great food. The day has finally come. I can’t contain my excitement. The World Cup is one of the great treasures along with the Olympics which gets thrown up every four years. It’s a heck of a debate which event is more fun. Tomorrow morning I will be sitting in some Mexican bar in the New York area eating nachos at 10am and drinking a Corona….the World Cup gives you permission to have a nachos beer breakfast. My goal is to seek out the best venues in New York to watch this glorius event. 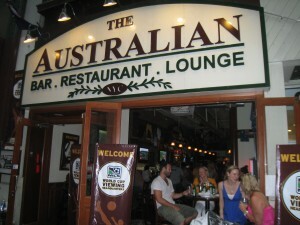 Four years ago I was in Germany celebrating the World Cup with my fellow Australian soccer fans. We all drank German beer and faked our way through football chants. On the day of the Brazil Australia match we stood back and saluted the Brazilian fans for the quality of chants, songs and partying before a game. As we grew more confident with each stein of beer skulled we began to mix with our new Brazillian friends. 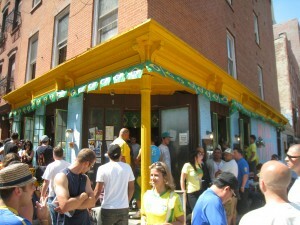 Just before kickoff green and gold was mixed in with Brazil’s green and yellow. Only before a World Cup match would you see Aussies riding plastic blowup kangaroos as they attempt to samba with beautiful barely clothed Brazilian ladies. Wish I took a photo of that but it’s pretty hard when you have both hands on a blow up kangaroo. This World Cup I am starting my global campaign in New York City. I will attempt to go deep into the fan’s pubs, drink beer and leave happy that I cheered for Mexico, Paraguay or Slovenia. I won’t be supporting the Serbs or the Germans as they are in our group. I know I am going to have some hiccups along the way to watch every game in a pub. The Mrs and looking after my ten month son will keep me honest but I will be doing my best to keep the spirit of the World Cup flowing on the streets of this baseball-loving city of New York. 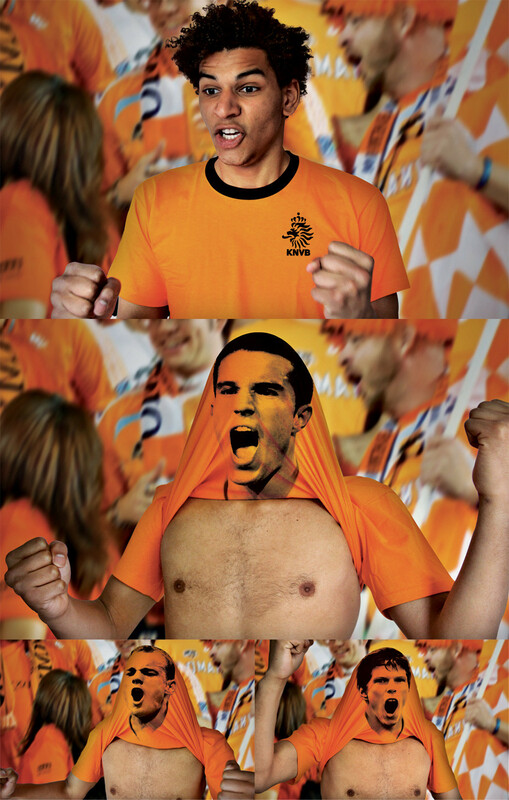 Check out these Dutch T-shirts. I flogged this off Drew Carey’s twitter page. The bottom player looks like Rooney from England. Who are the other dudes? Cool T Shirts though.